I’m in the leadership of the children’s organization at my church called the Primary. Sunday was the day that the children put on their program for everyone. 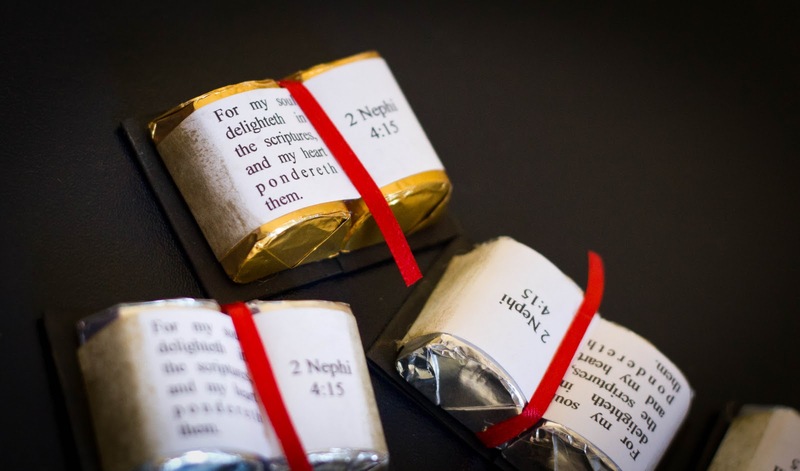 The theme of the year was “My soul delighteth in the scriptures.” So when thinking of a treat we could give them after the practice on Saturday, I knew I had to make these. I found them on Pinterest. The original post I saw is by Craft Critters. They are pretty easy to make, but a little time-consuming–especially if you are me. 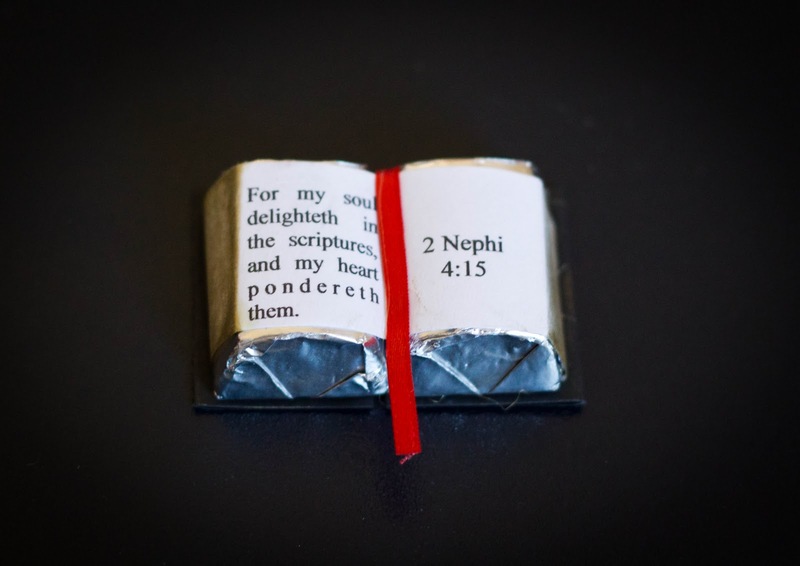 Each set of scriptures takes two Hershey’s Nugget candies. We did some gold and some silver ones (the silver ones are plain milk chocolate, which may be best if you are dealing with nut allergies). 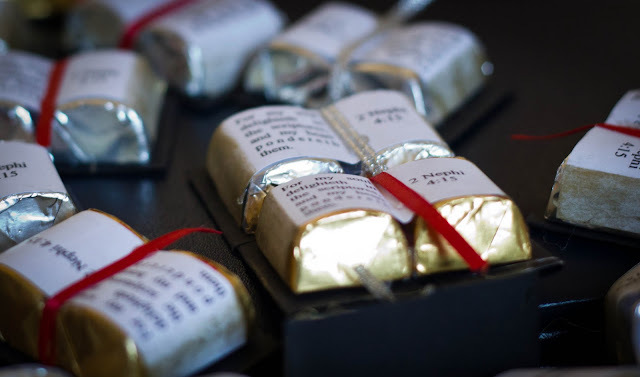 I hot-glued the chocolates to each other, first, then wrapped the pre-creased paper strips around to the back side, and glued on the ribbon in back before attaching them to the black cardstock “cover.” I used a tiny dot of glue to tack the ribbon down at the bottom of the book. Of course, I added a couple of details that made them a bit more work–cause I would cease to be me if I did everything the easy way. I inked the paper with gold ink on the sides of the pages. Also, instead of using a regular rectangle for the black cover, I cut strips of black cardstock and folded both sides over so the edges of the book would be thicker and more book-like. They were a huge hit! Some kids even wanted to save them to show their families before devouring the chocolate! 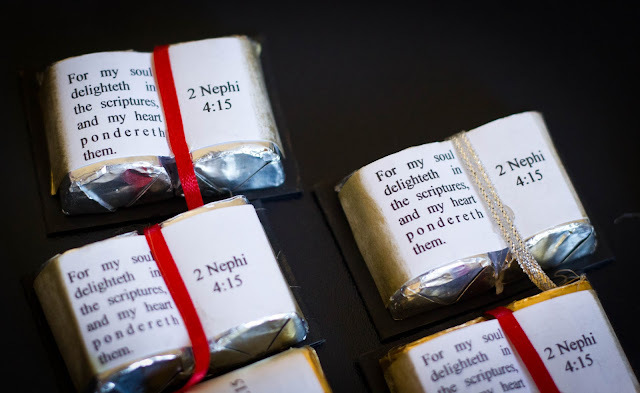 You could put any favorite Bible verse on these, or maybe even a quote from a classic author and make them as fancy books for a book club (Shakespeare, Jane Austen, Dickens, etc). If you like these, you might also want to check out the 3D Book of Mormon Bulletin Board I made for our Primary room. Kendra, those are so cute! I am jealous you only had to make 90. I am going to have to do treats for 175. yikes! They turned out so cute!! This is why Pinterest is so addicting:) Love the idea! totally darling! I'm the chorister and can I just say I'm so excited that our program is still a month away? Kudos to your folks for getting it all together in mid-Sept! These are so great! I am so glad I found your post because I was looking for something as a treat for my Sunday school class! You are so creative!! I am so happy I stumbled upon your blog. I can't wait to make these for our children's group. What a wonderful idea! I will hve to make some to give to the kids at church. Making these for our Awana Awards night for the tables and if this helps anyone, I found that using a text box on Publisher the size of 2.00 x 1.10 was a perfect fit for the Hershey’s nuggets ~ Thanks for the great idea…found it on Pinterest! Thanks for sharing your specs, Shelly! Just when I think you can’t get anymore creativity, you do! 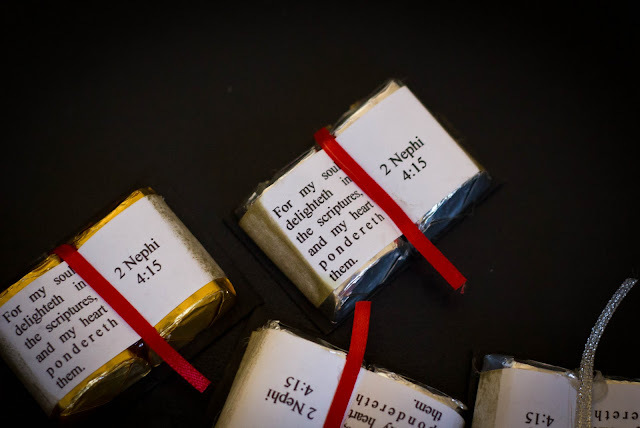 I belong to a Bible study group and last year I made bookmarkers for everyone biblically inspired. This delicious craft is so adorable! People love God’s word, people love chocolate….so I’m stealing this from you for my group this month. Thank you for inspiring me. You are now my best blogger! I hope your study group loves them!